I am Dr. Kenneth Dumack, a biologist working in the field of protistology. I started to explore the astonishing world of protists in my early bachelor studies. Since then I deepened my focus on soil microbial communities and absolved several modules associated with different research fields all around protistology. In my studies I gained insight into their ecology, diversity, phylogeny and biotechnology. The focus of my current work lies on evolutionary science of non-bacterivorous protists on which basis I draw conclusions about ecology. I focus on amoebae and amoeboflagellates in soils and their freshwater relatives. This website is meant to give an overview about my publications, interests and qualifications. Postdoctoral researcher and teaching assistant in the Terrestrial Ecology, University of Cologne. DFG funded research fellow in Daniel J G Lahr's lab, the Laboratory of Evolutionary Protistology, University of São Paulo, Brazil. Safety advisor in the Terrestrial Ecology, University of Cologne. phD student in the Terrestrial Ecology, University of Cologne. Scientific assistant in Michael Bonkowski's lab: Terrestrial Ecology with focus on protozoans, especially amoebae. Internship at Hartmut Arndt's lab: limnic ecology, University of Cologne, with focus on protozoans, especially heterotrophic flagellates. Internship at Sina Adl's lab: Department of Soil Science - University of Saskatchewan, Canada. Multiple subject modules in Michael Melkonian's lab and ecology, with focus on genetical and morphological analyses of the biodiversity in heterotrophic and autotrophic protists and biotechnology of microalgae. Internship at the Biologische Station Bonn with focus on ongoing field studies in renaturation of several habitat types and species preservation. Doctorate degree in Zoology in the Terrestrial Ecology. Master studies in Biological Sciences at the University of Cologne, Germany and in the University of Saskatchewan, Canada. Thesis:"Soil protists in a global change experiment". Grade: "Excellent"
Bachelor studies in Biology at the University of Cologne, Germany. Thesis: "Diversity of Amoebae in Tibetan Soils". Grade: "Excellent"
Oral presentation "Assessing the plant-associated protist microbiome"
One of my students, Hüsna Öztoprak, presented our research and was awarded by the German Society of Protozoology with the 3rd place for the Best Poster Presentation . One of my students, Christopher Kahlich, presented our research at the joined ISOP/ PSA conference. The work was awarded by the Gordon and Betty Moore Foundation, calling it of "exceptional potential interest". Additionally Christopher was awared by the International Society of Protistologists with the Holz-Conner Award and the Jahn/Bovee Award for the Best Student Presentation. Invited plenary presentation "Novel lineages in Cercozoa and their feeding strategies". Recipient of a Mobility Grant by the University of Cologne for a short term research stay at the University of São Paulo, Brazil. Oral presentation "Where does the Kraken belong?" 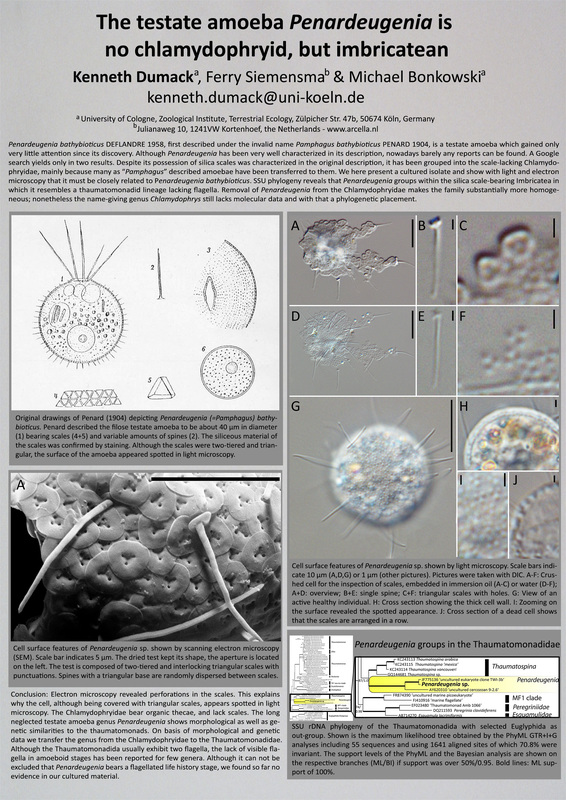 Poster presentation "The testate amoeba Penardeugenia is no chlamydophryid but imbricatean." Recipient of the Holz-Conner Award. 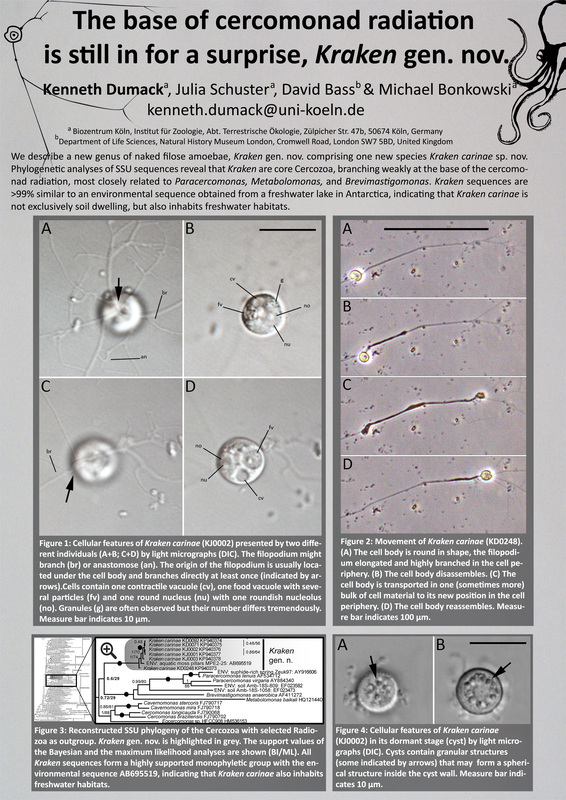 Poster presentation "The testate amoeba Penardeugenia is no chlamydophryid but imbricatean." Participant in the Barcelona Eukref Workshop focussing on Amoebozoa and Rhizaria. Oral presentation "The Chlamydophryidae revisited with special focus on the genus Lecythium"
Poster presentation "The base of cercomonad radiation is still in for a surprise, Kraken gen. nov." Recipient of the Holz-Conner Award. Under the honorable mentions for both, the best posters and the best talks. Oral presentation "A bowl with marbles; the fungal and algal-eating amoeba genus Lecythium (Chlamydophryidae, Tectofilosida, Cercozoa, Rhizaria) revisited; phylogeny and the description of four new species"
Poster presentation "The base of cercomonad radiation is still in for a surprise, Kraken gen. nov."
Second winner of the presentation award and the poster award. Title: "Lecythium, the neglected testate amoebae. Insight into phylogeny, morphology and ecology with focus on L. terrestris sp. nov."
Oral presentation "Lecythium terrestris, its morphology, phylogeny and autecology." Winner of the presentation award.